Event and conference programs and product catalogs are another of our specialties, as they require a high degree of skill in organizing and presenting a large amount of data—such as schedule grids and program guides—in a clear and user-friendly manner. The content in these projects is often updated right up until press time, so accuracy and timeliness is an utmost priority. 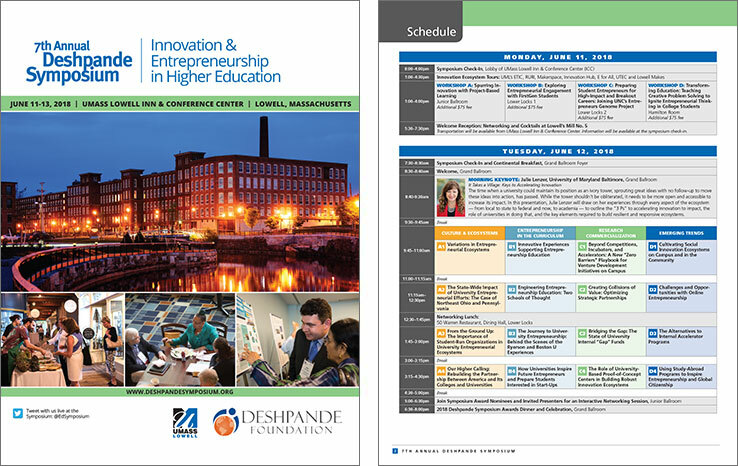 We recently completed design of the program for the 7th Annual Deshpande Symposium on Innovation & Entrepreneurship in Higher Education, which is sponsored annually by the Deshpande Foundation and UMass Lowell, as well as a catalog for UMass Lowell's plastics engineering seminar series. Other major program projects have included a 112-page guide to the International Symposium for Contempletive Studies, which was held in Boston in 2014. The symposium was the signature event of the year for our client, the Mind & Life Institute, and featured a Keynote by the Dalai Lama. We also produced programs for several other MLI events. Among our other catalog and directory projects were a series of book catalogs for Wolter Kluwer Law, as well as academic curriculum directories for schools and institutions. If you have an upcoming program or catalog project you'd like to discuss, please contact us. Design, page layout & production. Design concept, page layout & production.